Authentic premium pale ale made using the triple hopping process for those who appreciate the meaning and depth of beer’s aroma. The aroma of beer depends on the hops. 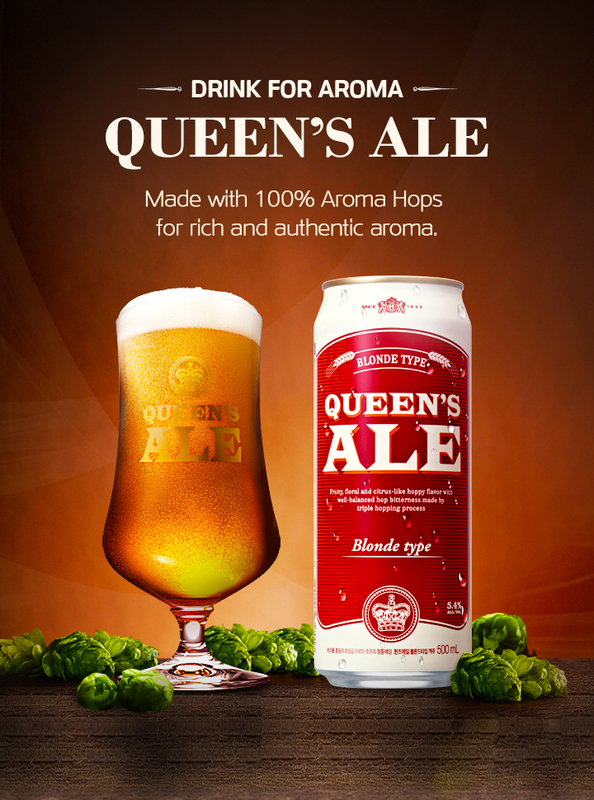 Made using 100% Aroma Hops, QUEEN'S ALE has the rich floral aroma of authentic ale. QUEEN'S ALE is made by adding hops 3 times using the Triple Hopping Process for richer and more authentic aroma. Hops are added only twice in other beers. After 3 minutes, ale’s rich aroma becomes perfect. 1 Pour it into the QUEEN'S ALE glass. 2 Wait 3 minutes before the aroma blossoms. 3 Enjoy the rich aroma and taste of 100% Aroma Hops.